This is actually a rather decent book on Queen Ingrid of Denmark. I read Sibylla: En biografi by the same author a while back, and didn’t care for the writing style at all, which I why I am surprised that this one worked for me. The reason for why this works is mainly that Lundgren has used, liberally, quotes from interviews and other books on the subject. His own writing voice has also seemed to mature in the three years between the two books, and it doesn’t feel so fawning and childlike. With the overflow of the quotes, it feels like a television documentary with Lundgren as the narrator, and the royals as the subjects. There is a literature list in the back, but I wish that he would have made it clear throughout the book when he was quoting from another piece of royal biography or when it was in direct interviews with the royals. For example, the story from Ex-King Constantine of Greece that his father-in-law locked Constantine into a bathroom when he came to ask for Anne-Marie’s hand in marriage, first came to my light with the DR television series about King Christian’s descendants (or other biographies, for all I know). If Lundgren did not get his information from there, but from an interview with Constantine, it would have been good to have that cited in the material. When there is not quotes to liven the material, from Ingrid’s younger years, or when her parents met each other, the story falls a bit flat because everything is so sugar glossy and nice. Overall, I don’t regret reading (or buying) the book, but there are some definite room for improvement. 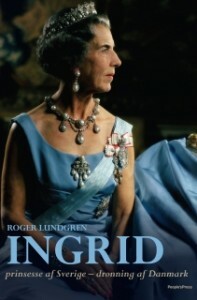 And while I, after reading the Sibylla book, had not planned on reading Lundgren’s newest book on Queen Silvia, I am now planning to do it.